The TFS product team has done a great job in facilitating the installation/configuration of Team Foundation Server 2010, but don’t get too excited about all this. Some scenarios are still a real challenge to complete successfully and require a lot of planning and testing. This all depends on the fact if you are migrating from a previous Team Foundation Server (2005/2008) and what type of TFS topology you are looking for. The easiest scenario is of course the TFS 2010 basic installation. A clean install of TFS 2010 on a client operating system (Vista / Windows 7). No hassle with SharePoint and SQL Reporting Services. This scenario can be done by every software developer and is perfect for having a local development playground for version control, work item management and build automation. You may be up-and-running in less than 1 hour! This is the only installation type where you don’t really need the famous TFS 2010 Installation Guide. The other easy scenario is when you want to setup a clean Team Foundation Server 2010 (no upgrade) on a single server (Application Tier and Data Tier are installed on the single server). This is especially true if you are using all new installations of prerequisite software to host the configuration database, the report server, and the portal server (Windows SharePoint Services 3.0). This scenario involves already some familiarity with the other (optional) TFS Components: SharePoint and SQL Server Reporting Services. Read more about the Single-Server installation procedure. Selecting a (complex) multiple-server installation for Team Foundation Server should always be based on actual requirements instead of the fact that it’s just cool in trying to set this up. Don’t even think about this scenario when your potential users are lower than 250. At this time the complexity will automatically increase because you will probably also need to pass the security department for getting clearance in required service accounts for TFS and you will also need to work closely together with the SQL Server operations team / SharePoint operations team to work out a matching infrastructure for the SQL Server database instance, the SQL Server Report Server, the SQL Server Analysis Server and the Microsoft Office SharePoint Server (MOSS or WSS). Most of the time they won’t give you immediately the infrastructure you really need. You will need to earn their respect and you will need to understand their overall policies. This is definitely the part where you won’t have full control of the situation. The bigger the company, the more time it will take to get agreement from all parties. Start as early as possible with these negotiations! Let’s shift to upgrading from a previous Team Foundation Server (2005/2008) towards Team Foundation Server 2010. In this case you have two possible options: an in-place upgrade or a migration upgrade. The in-place upgrade to TFS 2010 will use the exact same set of hardware that the previous version was using. The migration upgrade allows you to move at the same time to new and better hardware for all TFS Components. You might also want to consider moving from 32 bit to 64 bit servers. An extra difficulty might come up when the previous TFS installation is still using a SQL Server 2005 data store because TFS 2010 doesn’t offer support anymore for SQL Server 2005. Before going down the path of an upgrade, be sure to carefully read the TFS 2010 Supplemental Upgrade Guide at Codeplex. In my opinion it’s always better to go for the migration upgrade. On top of the benefits of new hardware for Team Foundation Server 2010 (always very welcome! ), you will always have an easy fall back scenario when the migration upgrade didn’t succeed. A running multi-server TFS 2008 instance with 150+ Team Projects. Team Projects should be split in different Team Project Collections that will match a specific division in the company. Not all divisions can and want to upgrade at the same time due to different important release cycles. Risk and possible impact are a lot bigger when everything is upgraded at the same time. 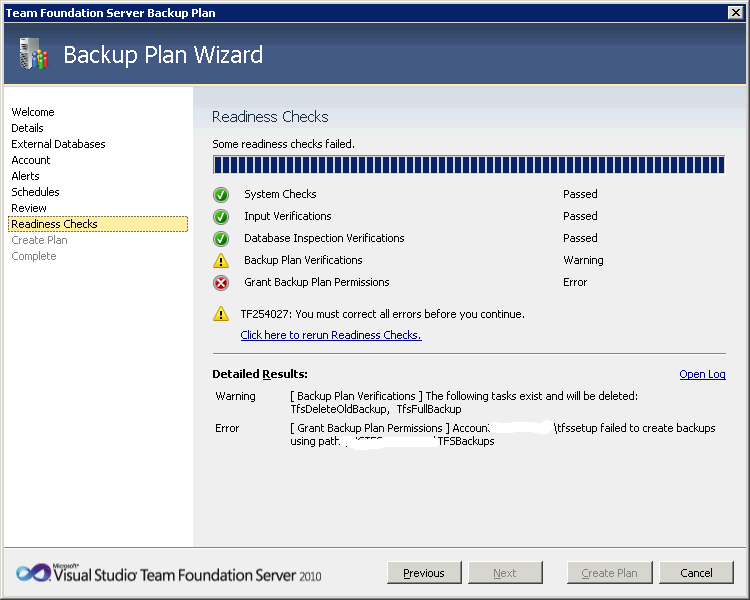 Perform a migration upgrade to TFS 2010. Split upgraded Team Project Collection in new Team Project Collections for dedicated company divisions that were ready for the upgrade. Divisions that were not ready for the upgrade can temporarily continue to work on the old TFS 2008 infrastructure. To investigate a future import of remaining 2008 Team Projects for one or more dedicated divisions into TFS 2010, a trial import can be executed. During the trial period all actions to become TFS 2010 ready can be studied (builds, reports, portal, …). Once the trials were successful, one or more (depending on the number of divisions left to move to TFS 2010) final imports can be performed to a new TFS 2010 Team Project Collection in combination with the rework necessary for bringing it fully operational on the new infrastructure. After all remaining Team Projects are imported in TFS 2010, the TFS 2008 environment won’t be needed anymore. Over time you will end up with a TFS 2010 environment with all desired Team Project Collections and you will have mitigated the risk of doing the one and only big-bang upgrade, forcing everyone to be ready at that particular time. One downside of the import command is that it does not upgrade reports or team project portals that are associated with the projects and databases to TFS 2010. That’s why it’s certainly a good practice to first perform an upgrade and to bring as many Team Projects back online in TFS 2010 after the initial upgrade. The original purpose of the import action is to consolidate different TFS environments into a single TFS instance. Setting up security for all Team Projects on all involved TFS Components (TFS, SharePoint and SQL Reporting Services) for all individual users might be quite frustrating and error-prone from time to time. I have seen this type of mismanagement once too many now. About time to publish some basic guidelines on how to manage Team Project security rights and permissions across all involved TFS components. Download my recommended strategy for getting rid of the familiar red crosses in Team Explorer and manage TFS security wisely. A final note to conclude: the explained Team Project permission sets are not the only available permission sets in the Team Project. Read my previous blogpost on fine-grained permissions in TFS 2010 for more information. While setting up a TFS Backup Plan (part of the TFS 2010 Power Tools) on a new Team Foundation Server, I ran into a security issue. [ Grant Backup Plan Permissions ] Account tfssetup failed to create backups using path TfsBackups. I didn’t get rid of this error after making sure that the tfssetup account had the appropriate rights on the shared network folder where the backups will be dropped. Giving Everyone modifications rights resolved the issue immediately, but of course that’s not the solution I was looking for. So, ProcessMonitor from SysInternals came once again to the rescue. There I found out that SQL Server (sqlsrvr.exe) was trying to access the shared network folder. Solution: also grant modifications rights on the shared network folder to the SQLService account that’s running SQL Server. On February 15, I will do a Microsoft Live Webcast on “What you should know about Version Control in Team Foundation Server 2010”. Unlike Visual SourceSafe (VSS), which relied on a file-based storage mechanism, Team Foundation version control stores all artefacts, as well as a record of all changes and current check-outs in a SQL Server database which makes it highly reliable and scalable. It supports features such as multiple simultaneous check-outs, conflict resolution, shelving and unshelving, branching and merging, and the ability to set security levels on any level of a source tree, alongside the most visible features of document versioning, locking, rollback, and atomic commits. The source control mechanism integrates with TFS Work Item Management as well. TFS administrators can enforce check-in policies that require specific requirements to have passed and individual versions of files can be assigned labels. This session is targeted towards developers who want to know all the details about the new version control features in Team Foundation Server 2010. You are currently browsing the Into ALM with TFS/VSTS blog archives for January, 2011.